Question 1: Am I Going Wide, or Deep, with Cisco Skills? Back a few posts, we talked about how there are many questions that come to mind when you first start with Cisco certifications. Some of these are questions you need to ask yourself, about the time when you start your CCENT or CCNA journey. Other questions are better answered by folks who’ve been through the process already, so their answers can help you through your own journey. Today’s blog subject poses an important question that newbies should ask themselves when starting out. In today’s post, I’ll break down the question a little, and hopefully give anyone new to Cisco some food for thought. And I’ll weave in a few opinions that matter to this question as well. In particular, in today’s post, I’ll suggest three branches of a certification plan that you can follow. In the next post, I’ll give you some ideas about how I think your choice impacts how you study. 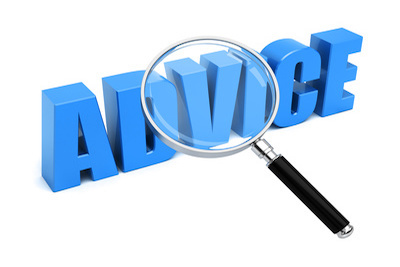 The three options to spelled out in this post all relate to how broad and deep you plan to go. This concept of breadth versus depth in IT skills has always existed. Your value as an IT worker will always be linked directly to your knowledge and skills, like it or not. A Cert certainly does not mean that someone truly has the skill – but it is a measurable way that some hiring managers use when looking at candidates. So the question is, when a hiring manager looks at your resume, and interviews you, and you talk about certs, how do you want to be perceived? And for the jobs you think you’d like to pursue, are you better off with broader skills, or narrower but deeper skills? I’m assuming you plan on jumping into Cisco certs – otherwise, you probably wouldn’t be reading here. But where does that fit with today’s question? Subquestion: Am I planning to get (or already have begun getting) other non-Cisco IT certs? First, let’s talk about the idea of being a technology generalist, with either CCENT or CCNA as just one of several IT certs in your resume’. Several articles over these last few years have shown a much larger need for people who can integrate and combine ideas across IT. It is a reasonable strategy to go for knowing something about many pieces of the pie. Maybe get a Microsoft cert, a VMWare cert, a Linux cert, and so on. I make no pretense at being an expert at telling you which other IT certs to go after. However, if you intend to go broad, for the Cisco part of the puzzle, stopping at CCENT, and not going on to CCNA, may make some sense. With just CCENT, you get a little on routing, a little on switching, a little WAN, some broad concepts, a ton of subnetting, and a ton of terminology. I don’t think stopping at CCENT helps much if you have to do networking work in that first job, but if you have to talk to the networking folks, it’s probably a good enough start. Subquestion: Is CCNA my path towards other Cisco certs that are unrelated to routing and switching? Next, let’s hit a few facts about Cisco certs that may be helpful to newbies who haven’t looked too deeply yet. Almost all Cisco certs require CCNA as a prerequisite. Data Center certs, storage, voice, security, and wireless, they all require CCNA. Figure 1 shows the beginnings of the hierarchy. You do not have to choose your path above up front, but it’s a good question to think about as you move along, because I think it changes how you study a little (in my opinion). Subquestion: Am I going deeper in routing/switching after CCNA, straight to CCNP? Cisco’s professional level certs include: CCNP, CCNP Voice, CCNP Security, CCNP Wireless, CCDP, CCIP, and CCNP Service Provider Ops. 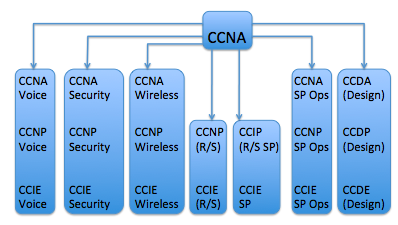 All require study and effort, but due to the CCNA pre-requisite, CCNP is the easiest lift. As you might guess, CCNP tends to be a popular choice, particularly for those wanting to fill the role as a network engineer. Note: Before I get cards and letters that I said that CCNP was easy, that’s not what I just wrote. It’s easier. It’s 3 exams additional past CCNA, while the others are 4, 5, or 6 exams more (including the need for other CCNA certs in other technology areas in most cases.) It’s just more work to go from CCNA to any other professional level cert other than CCNP, at least in my opinion. Also, I did some related posts back in my old Network World blog a while back. The first link goes to an index page, which links to three related posts. This next post links to a nice article from 2011 about the IT job market. You ask a very serious question that I wish was asked of me twelve years ago. At that time I was very new to the world of networking, but had a very good career in structured cabling. Over the years I have come understand what you said about being able to “integrate and combine ideas across IT”. Everyone I have discussed the topic of what path they should take thru this never ending landscape we call IT. I stress the need to diverse their knowledge and learn the supporting technologies of their chosen path. Because of my own goals of learning Cisco and the cabling connecting all of the equipment together, I’ve been able to land some very good contracts and jobs over the years. After re-reading your post, I noticed you have nothing about the CCT or Cisco Certified Technician. I have passed the ESTQ about two years ago and currently on my own accord studying to pass the CCT. I’ve seen on Cisco’s website that they classify this as an entry level cert. Do you agree with that? Personally I feel that this is a different track altogether, one that focuses on the equipment itself and not as much on the switching and routing like the CCENT. Wow, great question, Christopher. I totally neglected to bring up Cisco Certified Technician (CCT), a relatively new entry into Cisco’s cert portfolio. The short version on my opinion is that yes, it is for sure an entry level cert. It has no prerequisites, in that of the three current CCT certs, one of them has no prereqs, and the other two require the first CCT (CCT routing/switching). None of them require CCENT and CCNA. So they are indeed an option. I’m sure one reasonI forgot to mention them is that they fit a specific tactical role in Cisco’s cert world, rather than being part of the pyramid from CCENT, CCNA, CCNP, CCIE, CCDE. But that’s my hangup, not a real reflection on whether CCT matters. So, I think CCT’s a reasonable option as an end to itself, and as part of a get broad in IT and get broad in Cisco strategy. And it’s probably less time consuming to get than CCNA. If you want more, I did a 2-part blog series on CCT when it came out in 2011, back in my Network World blog. Go to this link for the 2nd post; it links to the first one.